Since its start in 1983, Cape Industries Ltd. has been involved in various marinerelated activities. Crewing, shipping agency, general stores supply, and Hyundai Heavy Industries' after-service agency for spare parts are just some of the activities that it has been involved in. From those humble beginnings, Cape has developed into a leading maker of cylinder liners for ship owners and engine builders within and outside of Korea. Cape has achieved global status due to its commitment to excellence, continued investment in new equipment and facilities, and sustained innovation. 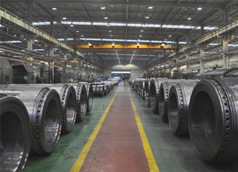 By focusing on the manufacturing sector, it is expected to further expand in the cylinder liner marketplace as well as in other heavy industrial manufacturing fields. Cape Industries Ltd. produces a cylinder liner for main engines that require wear resistance and high performance of major components during piston operation. The company's cylinder liners have earned ISO 9001, ISO 9002, ABS, DNV, KR, and other certifications. Cape's main customers are Doosan Engine, Hyundai Heavy Industries, Wartsila Switzerland, and shipowners and engine builders around the world. Cape plans to build a new facility to house all its manufacturing in one location where logistics and infrastructure are even better than at present.